Milder Hobart winter weather made sleeping under the stars more bearable than expected for MetroTasmania’s Chief Executive Officer Heather Haselgrove this week. Haselgrove, pictured far right, joined other CEOs from around Tasmania to sleep on the forecourt of Hobart’s Grand Chancellor Hotel to raise money for the Salvation Army’s campaign to support the homeless. The sleep-out raised $116,000 of which Haselgrove raised about $9000. 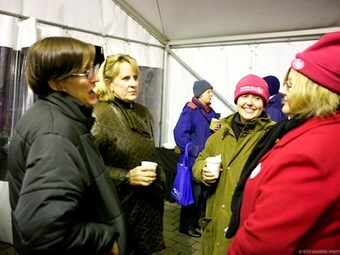 Tasmania’s Premier Lara Giddings also joined the sleep-out. "I was asked last year to do it and I thought why not, because it’s just one night of discomfort for me," Haselgrove says. "I emailed my contacts in the bus industry and everyone was extremely generous – I felt very humbled." Bus and chassis builders, other bus operators as far afield as South Australia, Western Australia and Queensland, along with Tasmania’s Bus Association each supported Haselgrove’s quest to raise money for Hobart’s homeless. "I was shocked to learn we have homeless people here in Tasmania – they’re not visible," she says. "When you walk around Sydney, Melbourne and Adelaide you are aware of the homeless, but here in Tasmania you don’t see them." Haselgrove says it’s the responsibility of any company that does business in a city to have that corporate responsibility. "This is one way we can give back to the community," she says.